Bark is the covering of the stems of woody plants, like trees. Bark protects the tree. Bark of different plants and trees can look very different, it can be rough or smooth and can have different colors. It is the outer layer of tree trunks. Most of the bark grows from the vascular cambium. Some outer parts of the bark sometimes come from a cork cambium. Plants with bark include trees, woody vines, and shrubs. Bark refers to all the tissues outside of the vascular cambium and is a nontechnical term. It overlays the wood and consists of the inner bark and the outer bark. The inner bark, which in older stems is living tissue, includes the innermost area of the periderm. The outer bark in older stems includes the dead tissue on the surface of the stems, along with parts of the innermost periderm and all the tissues on the outer side of the periderm. The outer bark on trees which lies external to the last formed periderm is also called the rhytidome. Products that come from bark include: bark shingle siding and wall coverings, spices and other flavorings, tanbark for tannin, resin, latex, medicines, poisons, various hallucinogenic chemicals and cork. Bark has been used to make cloth, canoes, and ropes and used as a surface for paintings and map making. A number of plants are also grown for their attractive or interesting bark colorations and surface textures or their bark is used as landscape mulch. What is called bark actually includes a number of different tissues. Cork is an external, secondary tissue that is impermeable to water and gases, and is also called the phellem. The cork is produced by the cork cambium which is a layer of meristematically active cells which serve as a lateral meristem for the periderm. The cork cambium, which is also called the phellogen, is normally only one cell layer thick. The phelloderm, which is not always present in all barks, is a layer of cells formed by and interior to the cork cambium. Together, the phellem (cork), phellogen (cork cambium) and phelloderm constitute the periderm. Cork cell walls contain suberin, a waxy substance which protects the stem against water loss, the invasion of insects into the stem, and prevents infections by bacteria and fungal spores. The cambium tissues, i.e., the cork cambium and the vascular cambium, are the only parts of a woody stem where cell division occurs; undifferentiated cells in the vascular cambium divide rapidly to produce secondary xylem to the inside and secondary phloem to the outside. Phloem is a nutrient-conducting tissue composed of sieve tubes or sieve cells mixed with parenchyma and fibers. The cortex is the primary tissue of stems and roots. In stems the cortex is between the epidermis layer and the phloem, in roots the inner layer is not phloem but the pericycle. The bark includes (1) through (5), and is composed of periderm and phloem and the cells that produce these tissues. The periderms includes (1), (2) and (3). Bark of a pine tree in Tecpán, Guatemala. In young stems, which lack what is commonly called bark, the tissues are, from the outside to the inside: epidermis, periderm, cortex, primary phloem, secondary phloem, vascular cambium, secondary xylem, and primary xylem. As the stem ages and grows, changes occur that transform the surface of the stem into the bark. The epidermis is a layer of cells that cover the plant body, including the stems, leaves, flowers and fruits, that protects the plant from the outside world. In old stems the epidermal layer, cortex, and primary phloem become separated from the inner tissues by thicker formations of cork. Due to the thickening cork layer these cells die because they do not receive water and nutrients. This dead layer is the rough corky bark that forms around tree trunks and other stems. 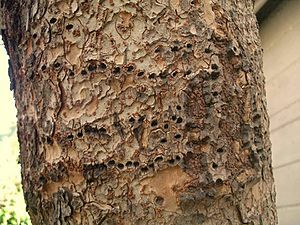 Often a secondary covering called the periderm forms on small woody stems and many non woody plants, which is composed of cork (phellem), the cork cambium (phellogen), and the phelloderm. The periderm forms from the phellogen which serves as a lateral meristem. The periderm replaces the epidermis, and acts as a protective covering like the epidermis. Mature phellem cells have suberin in their walls to protect the stem from desiccation and pathogen attack. Older phellem cells are dead, as is the case with woody stems. The skin on the potato tuber (which is an underground stem) constitutes the cork of the periderm. In woody plants the epidermis of newly grown stems is replaced by the periderm later in the year. As the stems grow a layer of cells form under the epidermis, called the cork cambium, these cells produce cork cells that turn into cork. A limited number of cell layers may form interior to the cork cambium, called the phelloderm. As the stem grows, the cork cambium produces new layers of cork which are impermeable to gases and water and the cells outside of the periderm, namely the epidermis, cortex and older secondary phloem die. The rhytidome is the most familiar part of bark, it is the outer layer that covers the trunks of trees. It is composed mostly of dead cells and is produced by the formation of multiple layers of suberized periderm, cortical and phloem tissue. It is generally thickest and most distinctive at the trunk or bole (the area from the ground to where the main branching starts) of the tree. Bark of pine was used as emergency food in Finland during famine, last time during and after civil war in 1918. 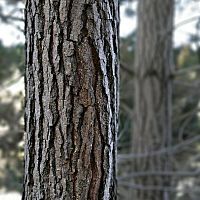 In some plants, the bark is substantially thicker, providing further protection and giving the bark a characteristically distinctive structure with deep ridges. In the cork oak (Quercus suber) the bark is thick enough to be harvested as a cork product without killing the tree; in this species the bark may get very thick (e.g. more than 20 cm has been reported). 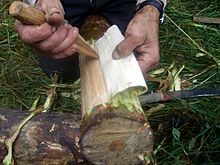 Some barks can be removed in long sheets; the smooth surfaced bark of birch trees has been used as a covering in the making of canoes, as the drainage layer in roofs, for shoes, backpacks etc. The most famous example of using birch bark for canoes is the birch canoes of North America. The inner bark (phloem) of some trees is edible; in Scandinavia, bark bread is made from rye to which the toasted and ground innermost layer of bark of scots pine or birch is added. The Sami people of far northern Europe used large sheets of Pinus sylvestris bark that were removed in the spring, prepared and stored for use as a staple food resource and the inner bark was eaten fresh, dried or roasted. Bark contains strong fibres known as bast, and there is a long tradition in northern Europe of using bark from coppiced young branches of the small-leaved lime (Tilia cordata) to produce cordage and rope, used for example in the rigging of Viking age longships. Among the commercial products made from bark are cork, cinnamon, quinine (from the bark of Cinchona) and aspirin (from the bark of willow trees). The bark of some trees notably oak (Quercus robur) is a source of tannic acid, which is used in tanning. Bark chips generated as a by-product of lumber production are often used in bark mulch in western North America. Bark is important to the horticultural industry since in shredded form it is used for plants that do not thrive in ordinary soil, such as epiphytes. Wood Bark has lignin content and when it is pyrolyzed (subjected to high temperatures in the absence of oxygen), it yields a liquid bio-oil product rich in natural phenol derivatives. The phenol derivatives are isolated and recovered for application as a replacement for fossil-based phenols in phenol-formaldehyde (PF) resins used in Oriented Strand Board (OSB) and plywood. Cut logs are inflamed either just before cutting or before curing. Such logs and even trunks and branches found in their natural state of decay in forests, where the bark has fallen off, are said to be decorticated. A number of living organisms live in or on bark, including insects, fungi and other plants like mosses, algae and other vascular plants. Many of these organisms are pathogens or parasites but some also have symbiotic relationships. The patterns left in the bark of a Chinese Evergreen Elm after repeated visits by a Yellow-Bellied Sapsucker (woodpecker) in early 2012. 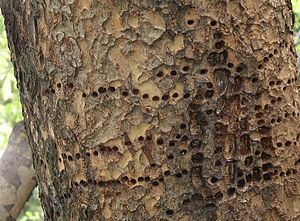 The self-repair of the Chinese Evergreen Elm showing new bark growth, lenticels, and other self-repair of the holes made by a Yellow-Bellied Sapsucker (woodpecker) about two years earlier. 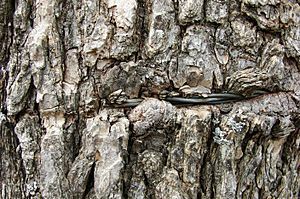 Frost crack and sun scald are examples of damage found on tree bark which trees can repair to a degree, depending on the severity. A rare Black Poplar tree, showing the bark and burls. Quercus robur bark with a large burl and lichen. Bark Facts for Kids. Kiddle Encyclopedia.